When choosing your driver fire protective clothing there are two major types of fabrics that you will need to consider, Nomex® and Proban®. Each of these brands has a different manufacturing process and a variety of different properties. Nomex® is the trademarked name for a type of fire retardant clothing that was developed and then marketed by the DuPont Company in the early 1960s. It is a meta-aramid material, related to nylon it has excellent thermal, chemical and radiation resistance. The fibre and sheet forms of the material are used in a vast number of applications, from the canopies of concert halls to the wings of the space shuttle. Nomex® is an intelligent flame-resistant fibre: it thickens when exposed to intense heat, creating a protective barrier between the heat source and the wearer’s skin. Nomex is a permanently fire retardant, woven or knitted into material and since it is inherently fire retardant its protection does not diminish with time or washing like Proban. 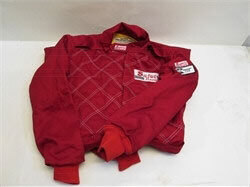 Nomex won't melt, drip, burn or support combustion in the air. Performance benefits like these play a pivotal role in providing the valuable seconds racing professionals need to escape and survive these critical situations. This product is miles ahead of any other material used, and that’s why FIA sanctioned that in FIA controlled racing classes only Nomex can be used as fire protection and driver protection suit. All major brands offer double, triple and multi-layer Nomex race suits for the best safety factor available in racing suits. These are rated SFI-5 as well as SFI-15 and SFI-20. We are all used to call Proban the material protective suit is made of. But Proban is in fact a chemical that can be applied to other fibres and blends to make them flame retardant. This means that Proban can be used not only for industrial, sport and military applications but across many civilian industries including hotels, public buildings, hospitals, nursing homes, anywhere fires are a risk. First developed in the 1950s, the Proban chemical is used to impart a durable flame retardant treatment to cotton and other cellulosic fibers and blends. Proban is a trademarked, quality controlled technological process based on specific chemicals developed by Rhodia. The process takes place at the finishing stage of cotton and cotton blended fabrics and involves various very specific steps - the technology is only available to Proban licensees. The Proban® process is used only by textile finishers licensed by Rhodia Consumer Specialties and is usually applied to bulk fabrics before making up. The Proban is only sold by Rhodia's appointed licensees. Licesees are carefully selected mainly on their ability to make Proban material at highest level of quality. Proban is a low molecular weight, polymeric chemical that is built around a phosphonium salt called tetrakis-hydroxymethyl phosphonium chloride (THPC). This salt is reacted at the chemical stage with urea, a low molecular weight polymer and the resultant chemical is placed on the fabric. THPC is first treated with sodium hydroxide solution and is converted to THPOH. The Proban process involves chemical impregnation. Drying and curing with ammonia gas using Rhodia's patented and licensed technology followed by oxidation and finally neutralization. Flame retardancy is achieved by the formation of a cross-linked inert polymer within the fiber. There is no chemical reaction within the fiber, hence the fabrics remain unaffected. A brief description of the flame-retarding of cotton fabric is as follows: fabric is dipped into a solution of the Proban chemical and dried to a specific moisture content. It is then exposed to a high concentration of ammonia gas. Next, it is oxidized with hydrogen peroxide, washed, again dried, then softened, with a high-density polyethylene textile softener. The process can be successfully applied to woven or knitted fabrics across the full range of fabric weights and constructions. Because Proban is a mainly cotton-based material that has been chemically treated to make it fire retardant, this treatment may diminish with washing. Proban FR/7A fabrics are certified by Westex Inc. to retain their original flame resistance through fifty home washes or twenty-five industrial washes. When heated, this flame-retardant breaks down to form acid on the fabric. This masks the cellulose of the cotton fabric and catalyzes char formation. The potassium coats the carbon and prevents its oxidation. The pyrolysis gases are non-flammable. This process is called a Condensed Phase process. Proban treated fabrics do not smolder, have no afterglow and flame does not spread outside the charred area. Unlike some other flame retardant systems. Proban® treated fabrics do not melt away to form a hole through which the flame can penetrate nor do they form hot sticky residues which can adhere to the skin of the wearer. As a protective driver fire retardant suit material (driver jacket on picture left), it is used primarily in single layer economy driver suits although there has been a disturbing increase in manufacturers using it to manufacture inexpensive multi-layer suits. The Proban suit may initially look like a bargain but the life span of the Nomex suit often doubles or triples that of Proban with proper care. Worse yet, it is impossible to tell when Proban may have lost some or all of its ability to protect the wearer in a fire. Plus, garments made from Proban treated fabrics should not be worn in environments where they could be exposed to acids, strong reducing agents and/or oxidizing chemicals. Unless a specific finish has been applied to the treated fabric. And all of this we can find in auto racing. Is there any comparison to Nomex suits verses Proban suits? Absolutely none and not even close when it comes to added protection. Nomex race suits are generally thought and used in most types of racing and can include novice or beginning areas of motor sports, but generally, the novice feels a minimum safety factor with a Proban race suit and thinks it's sufficient, but I always question when someone says, "good enough"? My view is that "good enough" is actually good enough when a person faces a worst possible situation without any consequences. There are many race suit marketing companies which offer these SFI-5 suits which are called double layer and are part Proban and part Nomex. And yes, they do pass the SFI-5 rating, but again, this is a dangerous game to play. These suits may look good and offer a cheaper price, but why not when you are buying a half treated cotton suit and only half of a Nomex race suit. Don't be fooled by many of these retailers or marketing companies which offer these half and half race suits. "MAKE SURE YOU BUY A COMPLETE AND WHOLE 100% NOMEX" double or triple layer race suit when you are looking for safety.